For other uses, see Black Sea (disambiguation). 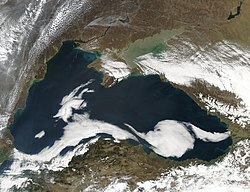 Satellite view of the Black Sea, taken by NASA MODIS. Another danger to people posed by the anoxic layer could come from a small asteroid's impact into the Black Sea. Recently modelling shows there is a significant threat to life for people living on the sea's shore. The Bosporus, taken from the ISS. Ivan Aivazovsky. Black Sea Fleet in the Bay of Theodosia, just before the Crimean War. Ancient trade routes in the region are currently being extensively studied by American, Bulgarian, and other scientists. It is widely believed that the Black Sea is packed with archaeology to be found. Perhaps the most promising areas in deepwater archaeology are the quest for submerged prehistoric settlements in the continental shelf and for ancient shipwrecks in the anoxic zone, which are expected to be exceptionally well preserved due to the absence of oxygen. Photo of the Black Sea near Gagra, taken in 1915. Cities of the Black Sea. ^ 436,400 km²—Black Sea Geography. University of Delaware College of Marine Studies (2003). Retrieved on December 2, 2006. ^ Unexpected changes in the oxic/anoxic interface in the Black Sea. Nature Publishing Group (30 March 1989). Retrieved on December 2, 2006. ^ The Danube Spills into the Black Sea NASA Visible Earth. Retrieved 2 December 2006. ^ Socio-economic indicators for the countries of the Black Sea basin. (2001). In UNEP/GRID-Arendal Maps and Graphics Library. Retrieved 2 December 2006 from http://maps.grida.no/go/graphic/sosio_economic_indicators_for_the_countries_of_the_black_sea_basin_giwa. ^ Black Sea Becomes Turquoise earthobservatory.nasa.gov. Retrieved 2 December 2006. ^ New Scientist, 4 May 2002, p.13. ^ Bulgarian Sea Resorts. Retrieved on 2007-02-02. Black Sea is surrounded by land, still it is not a lake since Bosporus and Dardanelles Straits connect it to the Mediterranean Sea. Surface water of the Black Sea is less saline and less dense, its temperature is close to that of air: warm in the summer, and very cold in the winter. Tiny marine plants of the Black Sea swarming in the water column are grazed on by microscopic marine animals, zooplankton: protozoans like infusoria and amoebas, small crustaceans, many other marine invertebrates and their larvae. It is connected with the Mediterranean (in the Aegean Sea) by the Bosporus, the Sea of Marmara, and the Dardanelles. The Black Sea has a length of about 1,200 km (750 mi) from east to west, a maximum width of 610 km (380 mi), and an area (excluding its northern arm, the Sea of Azov) of about 436,400 sq km (168,500 sq mi). The Crimea projects into the Black Sea from the north, forming the shallow Sea of Azov on the east and the Karkinitskiy Gulf on the west.